A verbal agreement may be enough to lend small sums to people you trust, but even among family and friends, a formal record of terms will prevent a disagreement later. Where the risk of default is higher, or the arrangement is more complicated, it is essential to record the arrangement in a document like this one. 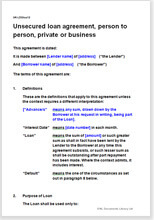 This unsecured loan agreement is intended for use in a family situation or between two people who know each other well, or to a director by his own company, where security is not required. It may be used for a loan by or to a limited company. If you are the borrower, you have the opportunity to edit any point you would prefer not to include. An unsecured loan is money lent from one party to another without any collateral to secure its repayment. In most cases, these types of loans are considered somewhat high-risk, since the lender does not usually have any way of forcing the borrower to comply with the terms or make payments on time short of legal action. For this reason, most unsecured loans carry relatively high interest rates and are often only available to those with strong credit scores. Unsecured loans are used primarily for small, short-term expenses, such as medical crises or wedding or funeral costs. The purpose of the loan does not affect the terms. The loan is usually intended to be repaid within about a year, though the terms can vary depending on the amount at issue and the relationship between the lender and the borrower. When a borrower does not have property worth charging, taking an unsecured loan may be his only way of obtaining a loan. Simplicity is another reason to seek an unsecured loan. When only small amounts of money are at issue, it is not usually worth the hassle of transferring property titles and establishing a collateral relationship. A simple contract can often be the best way to proceed, even if there are negative trade-offs. The agreement could be whatever you want to put in it, but we have provided a sound and comprehensive proposal containing options. It is supported by drafting notes so that you will know whether you can safely delete some provision. It is most unlikely that you will want to add new provisions, but if you do, it is easy. Our layout and use of plain English also make it very easy to edit by deletion. "A very useful find for an SME looking for good legal documentation."